"Dreams of the Heart, vol. I"
♥ A quote from a review: "Hopeful is actually a good word to describe this book of prose – hopeful. Looking at the beauty of love and reaching for guidance from above is even better than it sounds"
"Dreams of the Heart, vol. 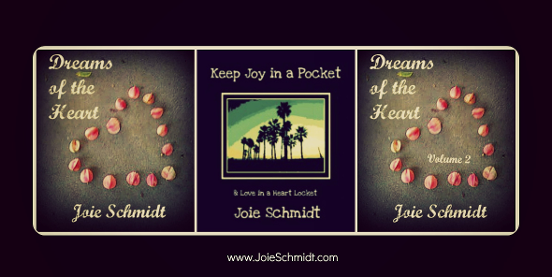 II"
"Keep Joy in a Pocket & Love in a Heart Locket!" ♥ "This is a touch of divinity"
♥ "You are truly a genius!!! With you your words and emotions!!!" ♥ "I think the best tribute I can give it is in saying it is 100% professional, it has all the ingredients of a prize winner, beautiful words, flowing with sensation and passion. PURE GOLD CLASS!!" ♥ "There are poets who write, there are poets who are inspired to write, while there are poets whose poems inspire." Excerpt from "Dreams of the Heart, vol. I"
Has always been, perfectly enough.